When you become a teenager, you reach the age of responsibility and some financial independence. You may want to earn money so you can buy the clothes you like or get music by your favorite artists. You may want to go out with your friends on Friday night and pay for the meal or the movie. If you are thinking of your future, you might also want to start putting money in a savings account for college or a new car. Performing various jobs can help you get the cash for whatever it is you need. There are a lot of part-time job opportunities for teens, and each position is something you will be able to do to make extra money and gain valuable work experience. Lawn mowing is an excellent summer job for a teen who does not mind putting in hard work. If you like to get a good workout, this might be the job for you. Many people in the neighborhood will not feel like mowing the lawn. The best way to get started is to knock on doors and ask if neighbors need help. Even with the internet being as popular as it is, people still love reading an old-fashioned newspaper. A delivery person is someone who brings the newspapers to the customer’s front door. Companies will hire walking or driving delivery people. The part-time hours are very early in the morning, but the pay can be decent. A babysitter is a great part-time job for teenagers. Parents may use a babysitter for work or a night on the town alone. Most people have either hourly or per day rates and they pay in cash. Babysitting is a very good job for teenagers because the hours are flexible and almost everyone in the neighborhood will need a babysitter at some point. All you have to do is offer your services and someone will accept them. 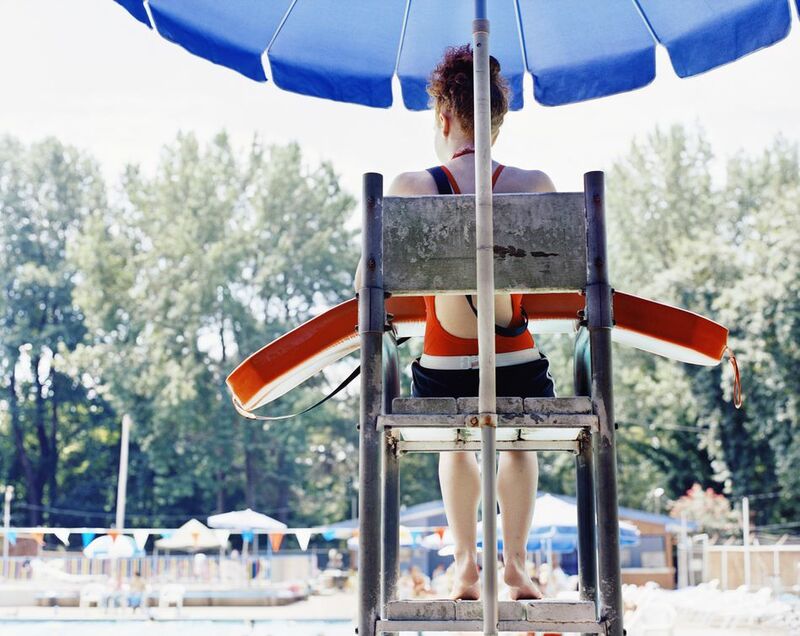 A lifeguard is someone who watches other people swim. This person also protects the swimmers if anything happens. This job can be worked on a part-time basis. However, you must have training in CPR and first aid to meet the hiring criteria. You might have to save someone's life one day so it is not a job to be taken lightly. Grocery stores are always looking for teenagers to serve as cashiers and baggers. Most grocery stores will want you to work during the school year after school and on weekends. If your parents own a business, you can help with filing papers, mailing letters, and other office work. In addition, you can work around your school schedule with flexibility; it's also a great weekend during the school year. Many teens can find starter positions in fast food restaurants based on the minimum age to work in each state. These establishments will usually hire people who do not have any experience. To work well in this position, you have to love working with people at a fast pace. Most fast-food restaurants expect servers to be very quick and work well under pressure. Dogs need to get out for exercise all year long, so dog walking is a great job for teenagers. Make sure you feel comfortable with the pet before you take the animal for a walk the first time. In addition to dog walking, you also can offer to pet sit for the animals while the owners are away on vacation. While this is often a great starter job for young children, it also is a very flexible job for a busy teenager. The responsibilities typically include stopping by a neighbor's house to feed an animal a few times per day while the owners are away. In addition, you also can offer to bring in the newspaper or mail and water any houseplants. Are you considering working a retail job to earn extra money? One of the greatest benefits of working in retail is the employee discounts. Many companies are very generous with the discounts they give their employees. Retail companies may hire kids as young as the age of 14. Retail companies are always hiring, especially in the summer, and often offer part-time work schedules. In addition to mowing the lawn in the summer, there are plenty of activities that homeowners may need assistance with throughout the year. Teens can explore tasks such as snow shoveling, raking leaves, and planting flowers, depending on the season. The jobs can be done alone or together with the homeowner. You can run a car wash part time. As a teenager, you can choose the hours that you would like to work and only schedule the car wash during those times. A car wash comes with a great deal of responsibility as you must be sure not to accidentally scratch or dent someone else's car. A camp counselor gets to spend time with energetic and enthusiastic youngsters who are happy to spend a week or two outdoors. If you enjoy babysitting or even playing with and teaching younger children, this could be a dream job for a teenager. Be sure to discuss with your parents your plans to earn money online. While there are plenty of legitimate ways to earn money online, there are scams you need to watch out for. Work with your parents to research companies before giving out personal information or entering into any work agreements. In addition, review the pros and cons of online businesses for kids. House cleaning is something any teen can do. Some elderly people and people with busy schedules like to have someone come and clean their homes. You could make a significant amount of cash cleaning houses and gather additional clients by doing a superb job. There are many nanny positions available for teens, especially in the summer when school is out. Many parents are on budgets, so they seek to hire younger people instead of expensive ​day care centers for the summer. If you like to golf, then a job working maintenance at a golf course could be the perfect job. Teens should explore jobs at places they like to spend a lot of time to find a job they will enjoy. If you are an older teen who has a vehicle, you can profit from running errands and driving other people around. Elderly residents might need help with grocery shopping or they may need rides to the doctor’s office. This is a great opportunity to make some cash while enhancing your driving skills. An amusement park is a perfect place for a teen to work. The environment is fun, the people are friendly, and the perks are appealing. If you are looking for an exciting new position, you can apply to work as a ride operator. It is a position for a person who is very detail-oriented and takes safety very seriously.